Puppy training, Puppy Care, House training. House train and crate train your puppy quickly and easily. No more harsh methods. Puppy hood only comes around once. What you do during your puppy’s first 4 months of life will have a lasting and sometimes unchangeable impact on your dog’s adult behavior. Raising A Behaviorally Healthy Puppy gives you the critical knowledge you need to make the most out of these formative months. • A step by step guide to crate training and MUCH MORE! 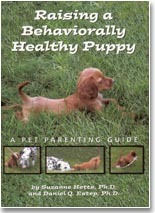 Suitable both for puppy parents and for trainers, veterinarians, and shelters to distribute in their puppy classes. Call or email us for large quantity pricing discounts. We have limited quantities of Puppy books that have been returned to us from book stores that show a little wear, but are "like new" and in good shape. Special September sale price through September 30th is only $4.97 each while supply lasts. Great for non-profits or for a lending library.